Ever had a great idea, but no funding to actually implement the concept? Want to start your own non-profit, but need some startup funding? Did your boss just send you a grant announcement and ask you to submit a proposal? Are you a student who needs grants to cover some of your tuition? Check out these key tips to help you craft a competitive grant proposal that stands out in a sea of applicants. Federal and State Government: All opportunities issued by the U. S. Government can be found on Grants.gov. Sign up for email alerts from the federal agencies most likely to fund your work like the departments of Education or Health and Human Services. Many state governments also post opportunities to a single site. Foundations: The Foundation Directory offers subscribers robust search features and an extensive database. If your organization does not subscribe, check your public or academic library for access to Foundation Directory services. Corporations: Search a corporation’s website for their community, giving or philanthropic page. Professional Organizations: Check out organization that you relate to your work like the American Physical Therapy Association or The American Society of Hand Therapists. 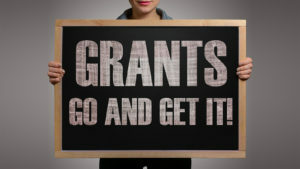 Most give grants and list grant opportunities. Civic Organizations: Every community is home to organizations like the Lions, the Elk, Giving Circles and Community Foundations. Sometimes their giving is modest, but it may be a great place to submit your first application. Does the grantee fund the kind of work you want to do? Make sure there is a good fit between your project and the type of funding and the purpose of the funding given by the grantor. Look for the average size of the award as well as how many awards are going to be funded. Make sure you or your organization matches the grantee’s eligibility criteria – think type of organization, size of organization and geographic area. If you are employed by an organization, find out who is authorized to accept or submit a grant. Build a timeline backwards from the deadline. Do you have sufficient time? Read the entire application and then read it again. Decide whether you can complete the application and budgets on your own or if you will need a team to assist. If it is a team effort, set up an initial meeting to gain support, brainstorm ideas, review the timeline and divvy up the requirements. If you are using multiple writers, be sure one person edits the final product to unify the voices in the application. Always ask someone, ideally not connected to the process, to read the entire grant before you submit. Mix data with stories about who will benefit from your work. Make sure to include sources for all your data. Local data is best, but regional or national data is better than no data. Mix text with graphics and charts. Use bolding and underlining to draw the reader to key points. Use organizing tools like headings, subheadings, and a table of contents, as well as page numbers and a bibliography. They Said No, What Can You Do? Ask the grantor for feedback; although, many times they just have more applications than money. Look at the list of funded proposals and see if you can read one that was funded. Before you submit another grant, reread the one that was rejected with a critical eye. While grants can be tough to secure, they can allow you to do great work. Let me know if you are successful using these tips!